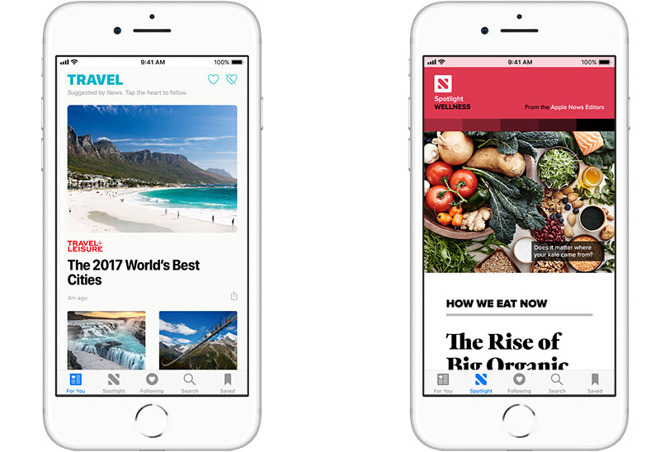 A report this week claims Apple is allowing select publishers to insert ads from Google's DoubleClick For Publishers into News app pages, an unexpected strategy shift that could lead to better monetization options for the iOS content aggregator. Citing sources within the advertising industry, AdAge reports the trial program is limited to a handful of publishers. The names of those publishers went unmentioned, but a number of big-name media companies like Cond Nast, Gannett, Time Inc. and CNN have been talking to Apple about potential changes regarding how the News app serves up ads, the publication says. While not a definitive shift away from Apple's established ad selling apparatus, inviting Google onto the News platform is an unexpected move. Apple has long touted its efforts to protect customers from potentially invasive services like DoubleClick, which harvests user information to deliver highly targeted ads. That said, many publishers already integrate Google's service into their campaigns. "Apple is just starting to do more for monetization," said one publishing partner. "We're starting to get excited about it, but can only design and develop ad inventory for Apple News once we have the right pipes in place." As it stands, News is a growing platform that attracts nearly 50 million monthly visitors in the U.S. every month, according to ComScore. The issue, however, is that Apple's ad setup prohibits publishers from taking full advantage of increased traffic. Currently, Apple implements a hybrid ad inventory system in which publishers can sell their own ad space within News pages or rely on a deal with NBC Universal to fill those spots for them. According to AdAge, many publishers say the setup is not lucrative. Further complicating matters, for publishers at least, is Apple's strict user data safeguards. Without broad access to technologies like cookies, publishers and ad services lack the information they need to deliver targeted content, which fetch higher prices than general ads. Citing one publishing partner, the report says Apple's data constraints cuts the price of ad inventory by at least half. Apple's staunch belief in consumer protection caused a kerfuffle last month when ad industry organizations penned an open letter in complaint of a new Safari web browser feature called Intelligent Tracking Prevention. The intelligent cookie blocking technology, which rolled out to end users in iOS 11 and macOS High Sierra, uses machine learning algorithms to reduce invasive cross-site ad vendor tracking, thus preventing users from being tracked without their knowledge. The inclusion of DoubleClick is not expected to fundamentally change Apple's approach to user data, as the service will be pursuant to the company's Advertising Platforms technology. Sources also said future integration with DoubleClick will not encroach on NBCU's agreement with Apple, which currently accounts for about half of all ad inventory sold in the News app. Whether Apple plans to expand the program is unknown, but publishers told AdAge there was hope DoubleClick would be offered to everyone by the end of the year.